The Glass Sellers’ Company enjoys a close association with the parish church of St James Garlickhythe in the wards of Vintry & Dowgate in the heart of the City of London. The church is just a short walk south from the Mansion House. Although the site has been a sacred place since the 12th Century, the original Wren church was completed in 1682. The unusual name Garlickhythe refers to a hythe or jetty used for unloading garlic in the Middle Ages when the land on which the church stands formed part of the Thames river bank. The Company’s association with St. James is of relatively recent origin. In 1954 the church was closed following the discovery of death-watch beetle in the roof timbers. It remained closed until 1963 and its reopening was in no small part due to the efforts of a Glass Seller, Liveryman Commander Ron Copp RD RNR (Rtd). Commander Copp and his mother Ethel lobbied the Bishop for the restoration of the then derelict building, finally extracting a promise that the diocese would match any funds raised by the parish. Following several colourful fund raising events including a visit to the Port of London by HMS Truelove (arranged by Commander Copp), a bazaar held at nearby Vintner’s Hall in 16th period costume, and the sale of the Parish Hall, half the necessary funds for restoration were raised and the Bishop provided the rest. The Church as we see it today was re-consecrated in September 1963. Since that time many Glass Sellers’ have been married and remembered and their children baptised in the glorious surroundings of St James, to the sound of the church’s magnificent original 1718 Bernhard Schmit organ. Every year in June the Master leads his Liverymen in procession along Skinners Lane to a summer service. From time to time the Company also holds a second service in the Autumn. In 1991, a crane on a nearby building site collapsed sending the counterweight crashing through the roof of the south transept causing extensive damage. A Chandelier given to the church by the Company was seriously damaged. However it was restored by the Company using the original designs and can now be seen creating myriad reflections from the sunlight, which thanks to the genius of Sir Christopher Wren, floods into St. James Garlickhythe, earning this dearly loved ancient place of worship the nickname ‘Wren’s Lantern’. Our close connection with St James’ church goes from strength to strength. 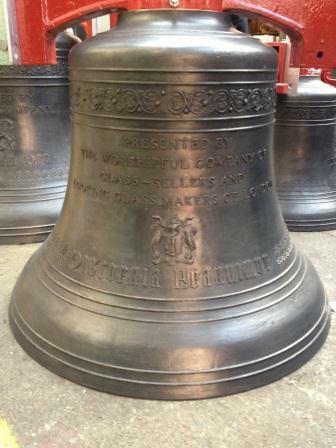 A set of eight bells were cast for St James’ to commemorate the Diamond Jubilee of HM Queen Elizabeth II. One of these was ‘Charles’ given by the Glass Sellers’ Company.